The Five Day Week Straw People were a one-off, studio-only British psychedelic band that did one rare album in late 1967 (actually released in 1968) for the budget Saga label. Its ten songs were loosely centered around the concept of a typical weekend in the life of typical working British people. 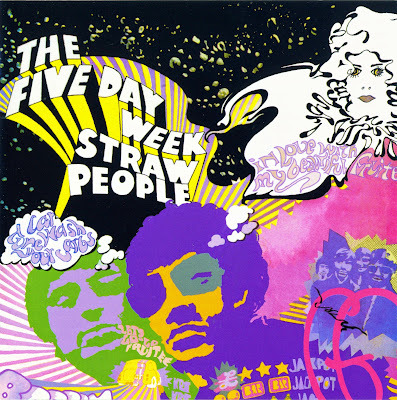 For a fee of 25 pounds per musician, the Five Day Week Straw People -- comprised of singer/guitarist John Du Cann (of the obscure psychedelic pop group the Attack, who did four singles for Decca), bassist Mick Hawksworth, and drummer Jack Collins -- were assembled. The album was recorded in about four hours in a London schoolroom, a remarkable achievement given that Collins had not heard any of the songs prior to the session.